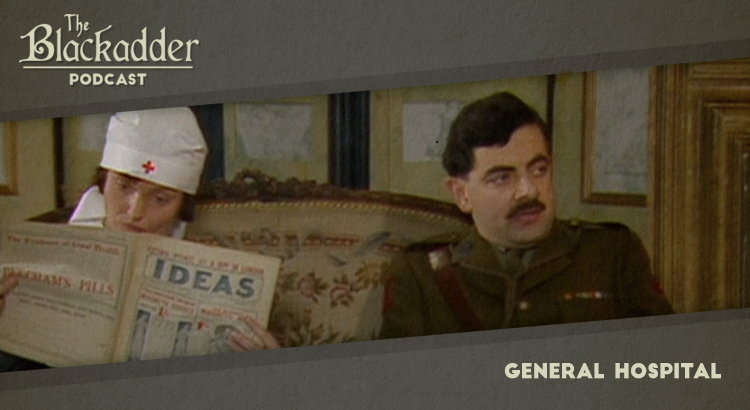 General Hospital was the fifth episode of Blackadder Goes Forth and features a budding relationship between Blackadder and a nurse at the local hospital. In this podcast Gerry and Iain consider ways to spot a spy and – perhaps more importantly – ways not to. This episode featured a crowd-pleasing return for a Blackadder legend as Miranda Richardson showed up and stole the show as Nurse Mary, the object of poor George’s infatuation and a satisfying foil for Edmund. Bill Wallis also appeared as a secret agent who had spent a little longer under cover than might have been good for him. Blackadder Goes Forth was written by Ben Elton and by Richard Curtis and all six episodes were directed by Richard Boden, who made his series debut in the previous year’s Blackadder’s Christmas Carol. Once again, John Lloyd produced the series and Howard Goodall was responsible for the music, with the title track performed by The Band of the 3rd Battalion The Royal Anglian Regiment (The Pompadour) with bandmaster Tim Parkinson. General Hospital was released in 1989. It is 30 minutes long and originally aired on the BBC. Blackadder Goes Forth is presently available on Netflix and a remastered set of the whole series is available on DVD around the world (Region 1) (Region 2).